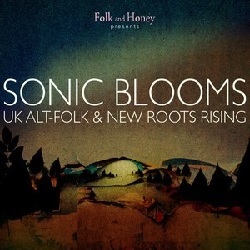 Folk and Honey, the leading UK gig listing website, is behind this compendium of emerging UK folk and roots talent and, as per the website’s MO for providing a platform for new artists that deserve an audience, the purpose of this double album is much the same. The first of what is billed as an annual venture showcasing a carousel of different sub-genres, Sonic Blooms is a particularly interesting offering that hits the target far more frequently than it misses (if indeed the weaker offerings herein can even be considered ‘misses’). As is often the predictable norm for any sub-genre that adopts the prefix of ‘alt’, the tone of this compilation is characteristically dark, eerie and haunting. The hushed, ethereal Americana of Ma Polaine’s Great Decline and Robert Chaney sit awkwardly but wonderfully against the wantonly weird Tom Waits-lite of Whiskey Moon Face and Brooke Sharkey. In turn, the generally acoustically weighted songs are punctuated by tracks from Mishaped Pearls (who sound just a little bit like Elbow), the jazzy complexity and vocal gymnastics of Low Chimes and dubby, bluesy repetition of Sisika -thereby ensuring the net result, if a little inconsistent, is most certainly not short on surprises. I Never Learned French by Josienne Clarke is a true highlight of the record and feels like it could fit easily into the wonderful, whimsical world of King Creosote. Elsewhere Icicle by Samantha Whates, a beautiful web of acoustic guitars and CSN harmonies, cascades around itself like the best song Badly Drawn Boy never wrote. Shifting seamlessly between two distinct and enchanting sections, it’s an absolute diamond of a song. As one may expect with any collection of music that attempts to distill down the key elements of a genre as broad as it is long into a cohesive package, ultimately the record fails to paint a complete picture. Having said that, by asking more questions than it answers (for example, based on this record I’m still not sure how I would define ‘alt-folk’ if someone asked me to) the record doubtlessly succeeds as a means to garner interest for artists that deserve to be heard.